We know in offices, shopping malls and in many other places where only the person with authorization card is allowed to enter the room. These systems use RFID communication system. RFID is used in shopping malls to stop theft as the products are tagged with RFID chip and when a person leaves the building with the RFID chip an alarm is raised automatically. The RFID tag is designed as small as part of sand. 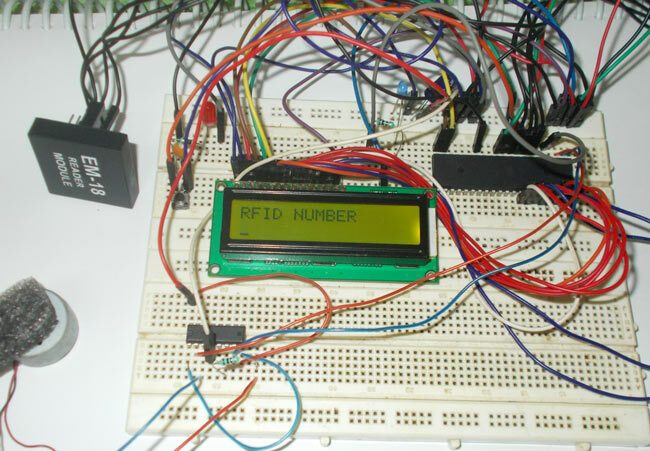 The RFID authentication systems are easy to design and are cheap in cost. Some schools and colleges nowadays use RFID based attendance systems. In this project we are going to design a RFID based toll collection system for security purposes. So this system open gates and allow people only with the authorized RFID tags. The authorized tags holder ID’s are programmed in to the ATMEGA Microcontroller and only those holders are allowed to leave or enter the premises. Hardware: ATmega32 microcontroller, power supply (5v), AVR-ISP Programmer, JHD_162ALCD (16x2 LCD module), 100uF capacitor (connected across power supply), button, 10KΩ resistor, 100nF capacitor, LED (two pieces), EM-18 (RFID reader module), L293D motor driver IC, 5V DC motor. In the RFID toll collection system circuit shown above, PORTA of ATMEGA32 is connected to data port of LCD. Here we should remember to disable the JTAG communication in PORTC to ATMEGA by changing the fuse bytes, if we wans to use the PORTC as a normal communication port. In 16x2 LCD, there are 16 pins over all if there is a back light, if there is no back light there will be 14 pins. We can power or leave the back light pins. Now in the 14 pins there are 8 data pins (7-14 or D0-D7), 2 power supply pins (1&2 or VSS & VDD or gnd & +5v), 3rd pin for contrast control (VEE-controls how thick the characters should be shown), 3 control pins (RS & RW & E). In the circuit, you can observe that I have only took two control pins. This gives the flexibility of better understanding. The contrast bit and READ/WRITE are not often used so they can be shorted to ground. This puts LCD in highest contrast and read mode. We just need to control ENABLE and RS pins to send characters and data accordingly. In the circuit, you can see we have used 8bit communication (D0-D7). However this is not a compulsory and we can use 4bit communication (D4-D7) but with 4 bit communication program becomes a bit complex, so I preferred 8 bit communication. So from mere observation of above table we are connecting 10 pins of LCD to controller in which 8 pins are data pins and 2 pins for control. Before moving ahead, we need to understand about the serial communication. The RFID module here sends data to the controller in serial. It has other mode of communication but for easy communication we are choosing RS232. The RS232 pin of module is connected to RXD pin of ATMEGA. 1. The RXD pin (data receiving feature) of controller must be enabled. 2. Since the communication is serial we need to know whenever the data bye is received, so that we can stop the program until complete byte is received. This is done by enabling a data receive complete interrupt. 3. RFID sends data to controller in 8bit mode. So two characters will be sent to the controller at a time. This is shown in above figure. 4. From above figure, there are no parity bits, one stop bit in the data sent by the module. RED (RXEN): This bit represents receive data feature. This bit must be set for the data from the module to be received by the controller. It also enables RXD pin of controller. BROWN (RXCIE): This bit must be set for getting an interrupt after successful data reception. By enabling this bit we get to know, right after 8 bit data receive. PINK (URSEL): This bit must be set before enable other bits in UCSRC. After setting, other needed bits in UCSRC, URSEL must be disabled or put to zero. YELLOW (UCSZ0,UCSZ1,UCSZ2):These three bits are used for selecting the number of data bits we are receiving or sending in a single go. Since the data sent by RFID module is 8bit data type, we have to set UCSZ0, UCSZ1 to one and UCSZ2 to zero. ORANGE (UMSEL): This bit is set based on whether the system is communicating asynchronously (both use different clock) or synchronously (both use same clock). Since module and controller use different clock, this bit must be set to zero or left alone as they are all set to zero by default. GREEN (UPM1, UPM0): These two bits are adjusted based on bit parity we are using in communication. Since RFID module sends data with no parity, we have set both UPM1, UPM0 to zero or they can be left alone as all bits in any registers are set to zero by default. BLUE (USBS): This bit is used for choosing the number of stop bits we are using during communication. Since RFID module sends data with one stop bit, we just have to leave USBS bit alone. Now at last we need to set the baud rate, from figure above it is clear that the RFID module sends data to controller with a baud rate of 9600bps (bits per second). The baud rate is set in controller by choosing the appropriate UBRRH. The UBRRH value is chosen by cross referring baud rate and CPU crystal frequency, So by cross reference UBRR value is seen as ‘6’, and so the baud rate is set. Now as shown in figure, two pins from controller goes to L293D, which is a H-BRIDGE used to control speed and direction of rotation for low power DC motors. L293D is an H-BRIDGE IC designed for driving low power DC motors and is shown in figure, this IC consists two h-bridges and so it can drive two DC motors. So this IC can be used to drive robot motors from the signals of microcontroller. So as shown in above table, for clock wise rotation 2A should be high and 1A should be low. Similarly for anti clockwise 1A should be high and 2A should be low. Whenever an authorized card is brought near the module, the motor is programmed to move clockwise for a second, to show the toll gate is opened after a second it comes back, telling the toll gate is closed. The working of toll plaza is best explained in step by step of C code give below. Below is the line to line explanation for the code of RFID Toll Collection System. You can understand the concept and working of this project by reading the code below. To download or copy, you can find the complete code at the bottom of page. DDRB = 0b11110000; // Taking some portB pins as input. /* After dumping the program in the controller one must take the cards which must be authorized and get the tags ID. These are obtained by placing the tag near RFID module and the ID will be shown on the screen. After getting the IDs, the program must be updated by replacing the below ID numbers with new ID numbers. Now in above we are authorizing only five cards, these can be changed to any number. COUNTA=UDR; // UDR stores the eight bit data received and is taken into an integer. The description is well explained.this is very useful project mostly to use on toll tax collection booth. Do we need some external memory to store the details about the balance or any information about the tag details.